So, October is almost upon us as the third year of my degree is taking off. As I cling desperately to any type of work that will not be subjected to in depth critical analysis, I’m opening my diary for commission work! I realise the ‘C’ word is a sensitive matter.. (‘C’ word being Christmas of course, you crude people! ), but Christmas on the horizon and what better way to tell someone you couldn’t think of anything else to get them, other than a drawing by yours truly. Mad aunt that you don’t know what to buy for? Cat fanatic that you’ve run out of mugs/t-shirts/coasters to get? Want something a bit different for your Christmas cards? Get in touch via my contact form or through the usual social channels and we can talk business. In more positive news, this past week I’ve finished working on a second batch commission which follows on from the Japan skiing work I showed you all last week! I’m thankful to have been asked to produce drawings for the upcoming film by Jeffrey Loewe, and as soon as I can show you all the masterpiece in action I will. For now, here’s a nifty preview of the four portraits I created for Jeff. Drawing four gentlemen’s faces was a little more work than I anticipated, but it was definitely a lot of fun to work on, keeping with the theme of the title shot from last week. So, thanks Jeff! In other news, the Art Aid Nepal anthology I created an illustration for back in June is now being crowd-funded on Kickstarter! You can go have a look and support the book by clicking here, and make sure to hold onto your hats as there is an impressive list of contributing artists including the zen-inspiring powerhouse Mike Medaglia and the charming brains behind Tempo Lush and Lucy the Octopus, Richy K. Chandler. Here’s what the creators have to say about the project.. 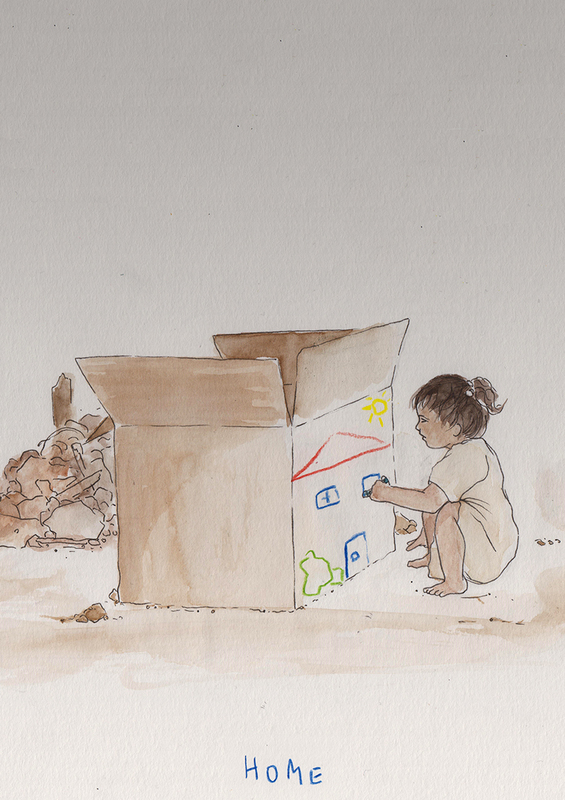 The proceeds from the anthology will go towards providing art workshops to children living in tented camps in Kathmandu as a result of losing their home in the devastating earthquake that struck Nepal on the 25th of April 2015. The 7.8 magnitude quake created a lot of destruction and loss of life. Even those who survived were not spared the mental trauma and even months later the aftershocks causes our hearts and minds to tremble. Thousands of adults and children lost their homes and are still displaced. The need to help them remains, for their troubles are far from over. Art Aid Nepal enable us to use our ability as artists to raise funds. We wanted to do something to help children recover from the trauma that they faced during the earthquake and which resurfaces after every aftershock. There have been nearly 400 aftershocks over 4 magnitudes since the first quake. We reached out to our artistic community and 32 talented artists from multicultural background have come together to explore the concept of HOME. Their illustrations and comics fill more than 90 pages of this anthology in full vibrant colour. Those who have also lost their home and are now living in tented camps. Many of these children had very little access to creative pursuits and now, after the quake, their options are even more limited. The Children’s Art Museum of Nepal have been conducting art workshops in the temporary learning centres in public schools. Together with Art Aid Nepal, we would like to extend these workshops to the more deprived children in the tented camps. There are currently 30 camps for displaced people in Kathmandu valley. We will be conducting the workshops in the largest of these camps in Chuchepati which has more than 8000 families living and 200 children under the age of 12. Now, I realise a lot of people don’t really ‘do’ charity. Maybe throw some loose change in a bucket or donate a little every few months to a particular charity. As a student and someone who has never been affluent, always below the sadly titled ‘living wage’, I can empathise with reluctance to give away money. However, I strongly believe that as human beings in such a drastically changing world it is important to look beyond ourselves and our problems. I freely created work for Art Aid Nepal because I strongly believe in bringing a smile to a child’s face, distracting them from the fact their world lays in pieces. If you wish to spare as little as £5, support the project here. On that serious note, that’s it for this week folks! I shall dutifully be back next week with the beginning of the University projects.. Ooh err, best get cracking. Over and out! Autumn Is in the Air.. So, it is officially autumn now. The nights are getting longer and the bags under my eyes are getting heavier, and the ‘Christmas’ word is starting to be thrown around. This past week I took some time to travel back to my homelands to get some rest and recuperation before University starts up again next week, and such recuperation included climbing around castle ruins and eating an lot of very nice food; what could be better? Before I travelled far and wide for my three days of feasting, I began work on a fun piece which is different from the kind of work I’ve been producing this past year. As a single illustration piece centered around a scenic view, I was able to really get my teeth stuck into it, looking at how to make the piece work on its own (rather than with comics work having panels complementing each over and working together). Also, I had a chance to play around with creating my own text, which is something I’ve barely touched for a number of years now, and I really enjoyed getting back into it. 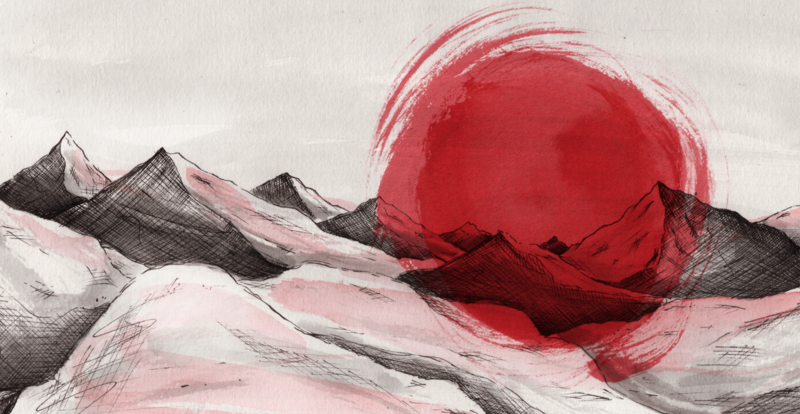 Based around the theme of Japan and skiing, this work was a refreshing change and had my brain ticking in all sorts of new ways – and, bonus points, this piece is for video rather than print (ooh err).. 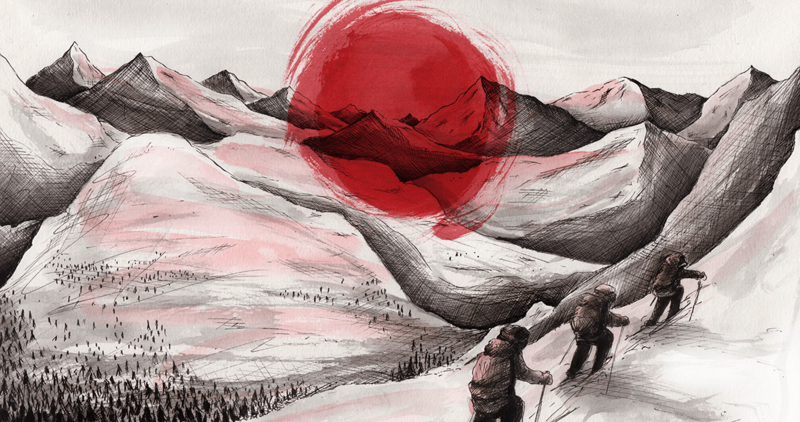 Without sounding too much like a stuffy art person with my strange terms and deep, complex thought trails, the main ideals for the work was a sunset over mountains, with snow and skiers. Using my particular way of seeing the world but merged with historic Japanese black ink washes, I think it’s worked pretty well. I’m a big fan of mountains, as you all may have guessed, but I made sure to draw them in a different way this time to really highlight the harshness and beauty of dawn. Well, tried to, anyway. The text was a lot of fun too; with two working titles to make I looked at stereotypical fonts and kind of took on my own path from there, painting the text with a brush to keep it in the general tone of the drawing. In other words.. I painted words to complement that drawing up there, and I think it went okay. So, another success story and more things are gradually getting crossed off the ‘things to do before Uni starts up again’ list. I still have a few things up my sleeve, and with starting back for third year on Tuesday rather than Monday I have an extra day to squeeze out as much efficiency as possible before all hell breaks loose. In other news, during my time in the homelands I came back via Birmingham and made sure to visit the owls on the Hoot Trail! The Big Hoot is a free event in Birmingham that has run from 20th July and finished on 27th September, featuring many, many owl sculptures painted by artists. The owls are dotted around the City Centre, with a few in the surrounding areas towns of the greater Birmingham area. By getting involved, buying items from the online shop and the final stage of the big owls going to auction, it’s all in effort to raise money for Birmingham Children’s Hospital. I’m always a big supporter of getting art out into the community and getting people involved, especially when it’s for an important cause. Plus, who doesn’t love owls?! If you’re around Birmingham and have a chance to see them in the next few days, you can get a trail map from the website or download an app to follow the trail with your phone. If not, there are an abundance of pictures with the hashtag #thebighoot2015 and the Farewell Weekend is around Millennium Point in Birmingham on the 10th-11th October. Aren’t they pretty! I had an absolute hoot looking at the owls (sorry, sorry..) and it was a soul-warming experience to see young and old getting up close and excited about the owls around Birmingham. That’s it for now! The sneaky things up my sleeve await, and the kettle is calling my name. Until next week!